The Museum is situated in two historical buildings, the Guardhouse and the Agency and, since 2003, in a new building with storage areas and staff offices. 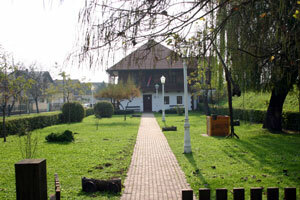 The Museum buildings (the Guardhouse, the Agency and the storage area with offices) are situated along the Sava river bank in the west part of Županja. The Županja Military Border guardhouse is the only preserved example of such Military Border defence architecture along the very long former Sava borderline between Austrian and Turkish areas. It was built at the beginning of the 19th century as the central border checkpoint or, in other words, as a guardhouse on the Turkish border. When the Military Border system was abolished, the building became municipal property and, in 1907, private property. The guardhouse was a residential building until 1957 (or 1964), when it was finally purchased to serve the needs of the Museum. The Županja guardhouse is an example of a closed military building with a porch. It contained rooms for border-soldiers and, most probably, the flat of a cordon officer – the captain. An inner stairway led to the first floor and the porch provided the border-soldiers with a better overview of the border and made their displacement easier. Even though the Guardhouse retained the main features of the original architectural design, it has somewhat changed. The ground floor was initially open: three rows of four pillars supported the first floor with massive oak porches. An adaptation in July 1982 revealed that the wooden pillars in the Guardhouse had been replaced with brick columns at the time of the Military Border, after the passing of the General Military Border Law in 1807. It has also been established that the English from the Tannin Factory changed the layout of the building significantly, especially its inner arrangement and room design and, probably, the shape and size of the windows upstairs. The adaptation in 1982 aimed to remove the walls between the columns on the interior ground floor, which would meet the needs of the Museum and provide it with a space where its cultural and historical material could be displayed. As it is a rare cultural and historical monument, as well as an architectural monument, the Military Border guardhouse is a registered and protected first-category cultural monument. In the late 1990s the necessary building works were carried out and the Guardhouse building was ready to house the permanent display. 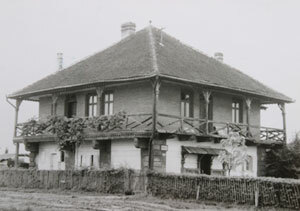 The Agency building was erected in the mid-19th century, at the time when the first Croatian steamboat Sloga (Concord) navigated the river Sava on a permanent line between Sisak and Zemun. 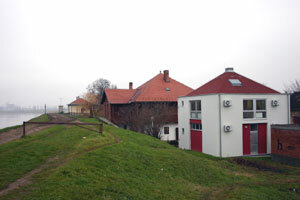 Since Županja was a very important stop between Zemun and Sisak, the steamboat agency must have erected a storage building there and that is how the building got its name. However, before the mid-19th century when the agency building was erected, there had probably been a border checkpoint (rastellum) used for the exchange of goods with Bosnian merchants. After the Second World War, the Agency building housed the local Youth Centre and a driving school, and in 1977 it was given to the Museum. The Agency building is a registered cultural monument. In 2000 and 2001 the permanent ethnological display was mounted there. Because of a constant lack of space, primarily for storing and keeping the museum material, Stjepan Gruber built a storage building near the Guardhouse as early as in 1969 and at the beginning of 1970. The capacity of the building, however, was rather inadequate for the growing needs of the Museum and it wore out in time, so in 2002-2003 a new storage building with offices was built where the old depot had been. 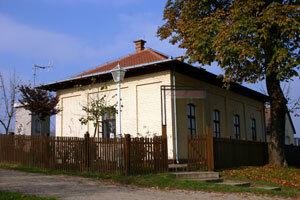 Apart from the main buildings (the Guardhouse, the Agency, and the new depot building near the Guardhouse), Stjepan Gruber - Local History Museum comprises another smaller building of the surface of 16.5 m2 near the Agency and a museum park between the Guardhouse and the Agency. In 2006 the Museum and the Horse-breeding Association Old Border-soldiers from Županja, sponsored by the Croatian Ministry of Agriculture and Forestry, built a temporary construction - a wooden porch destined for various events, such as Konjarske vatre (Horsemen Fires) which have been a part of a festival called Šokačko sijelo for the last few years. Throughout the year the construction will house occasional displays of larger museum items, such as horse-drawn carts, sleighs, parizers, and alike.